Hi there! Hannah here! 😀 Today I have a technique video to share! I created this card and I thought I’d show you how! Watercoloring with Distress Inks is one of my favorite techniques the colors stay true to the ink, and the ink moves so wonderfully. You can dilute it as much as you want, or keep it as strong and rich as you wish. 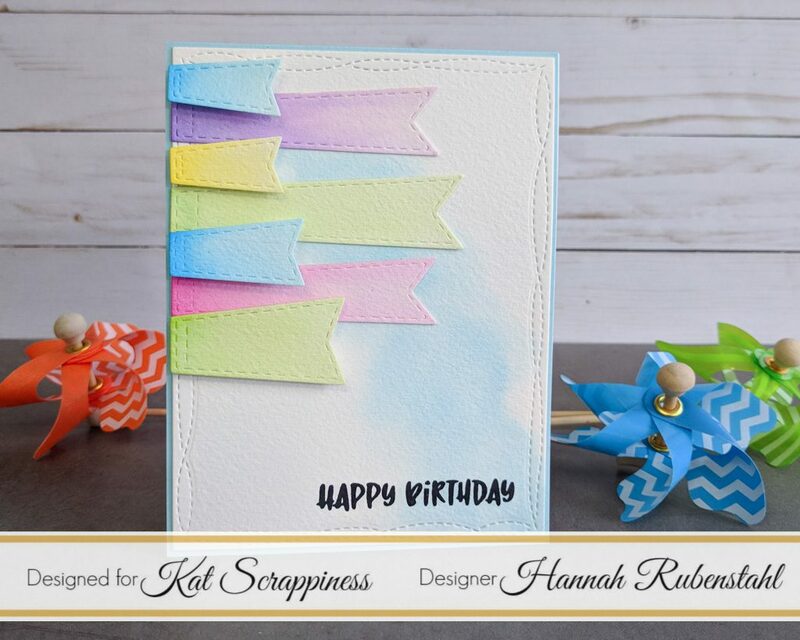 This card was the perfect reason to showcase Kat’s new Stitched Flag Dies! The sentiment I used is from the new Dad’s Tools stamp set, which just shows you how versatile the set is! Have a quick look at my video! I hope you enjoyed my card(s) and my video. I also hope that you took my mistakes to heart, it is just paper and it is a great learning experience! This has been Hannah Rubenstahl, of Fanciful Spaces, hoping you have a crafty day, and if you need any of the products I used, feel free to use my discount code: Hannah10! Create a Faux Coffee Look! Making Your Kat Scrappiness Die Cut Sentiments Faux Enamel!